At one of the rallies, in front of a McDonald’s in Harlem, you sensed this new coalition could well determine who captures the White House next year. Fight for 15 protestors gather in front of the 125th St. McDonald's in Harlem to ask for higher minimum wages on Tuesday. But Tuesday’s coordinated fast-food strikes in some 270 cities weren’t simply for higher wages. “Black Lives Matter and Fight for $15 should be united because in both cases it’s largely about minority people,” Shawnette Richardson, 43, said. 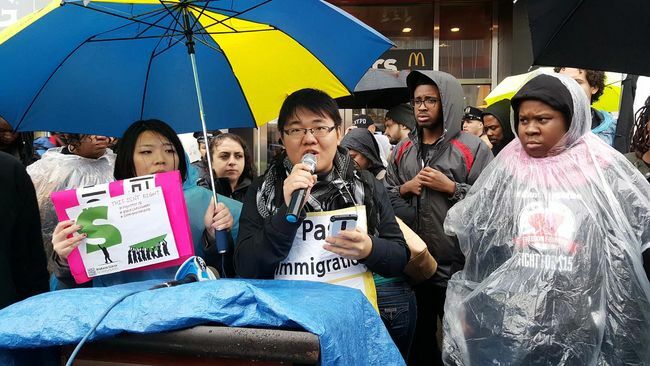 Protesters at a 125th St. McDonald’s on Tuesday are clear in their demand: Economic and racial justice. A widow and mother of three, she currently works at McDonald’s, and for years before that she toiled at a Checkers restaurant in Brooklyn. “I was doing the job of four people but was paid for one — and got only $8 an hour,” she said. In Jang’s case, his family embodies the connection. He and his mother arrived in the U.S. from South Korea in 2005 on a visitor’s visa. She had agreed to marry an American citizen, he said, but things didn’t work out. “Our visas expired and we were left here, undocumented, with no friends or family, and no money,” he recalled. He’s also benefited from President Obama’s executive order providing temporary status for those brought here illegally as minors. “I’m protected, but my mother could still be deported,” he noted. Leaders of the Black Lives Matter and immigrant rights movements have joined ranks in a united front with Fight for 15.